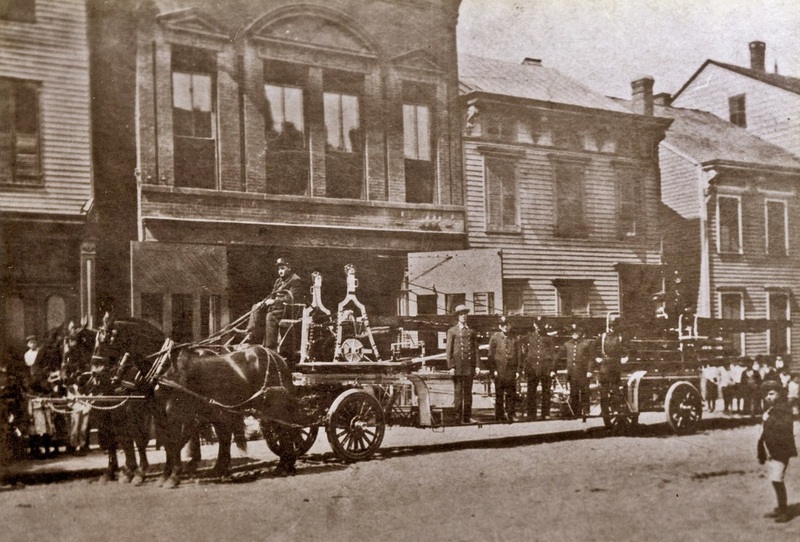 This firehouse at 72 Jackson Street (between Green and Slater Streets) was built in 1873 to house Eagle Hook and Ladder Company 1 (organized March 22, 1839) of the Volunteer Fire Department. 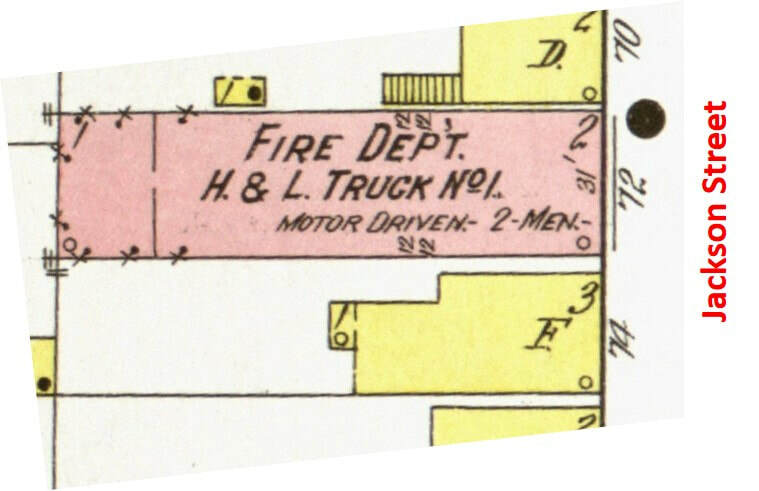 In July, 1880, the house, apparatus and furniture were burned up and their house was immediately re-built in the same location. 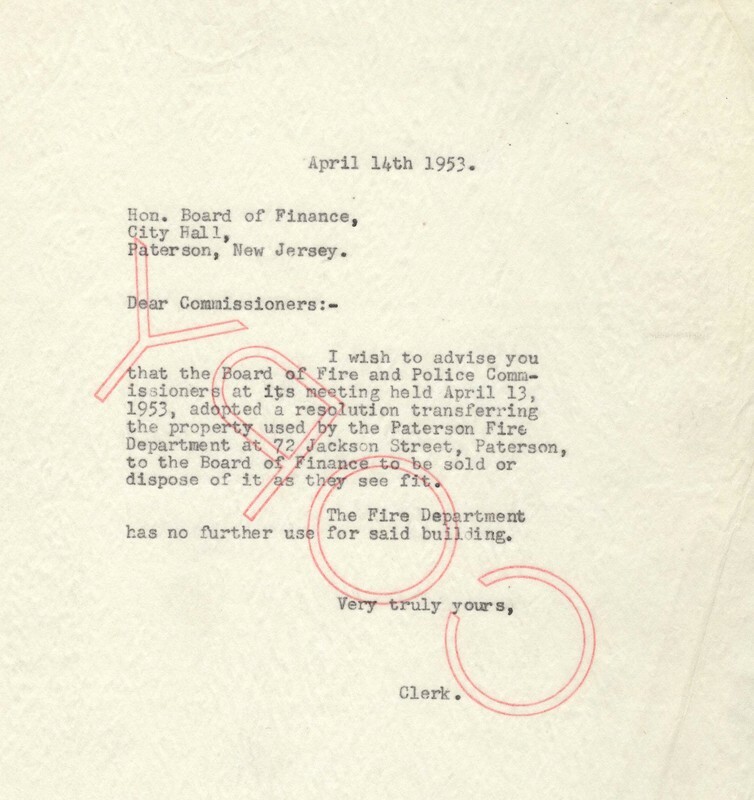 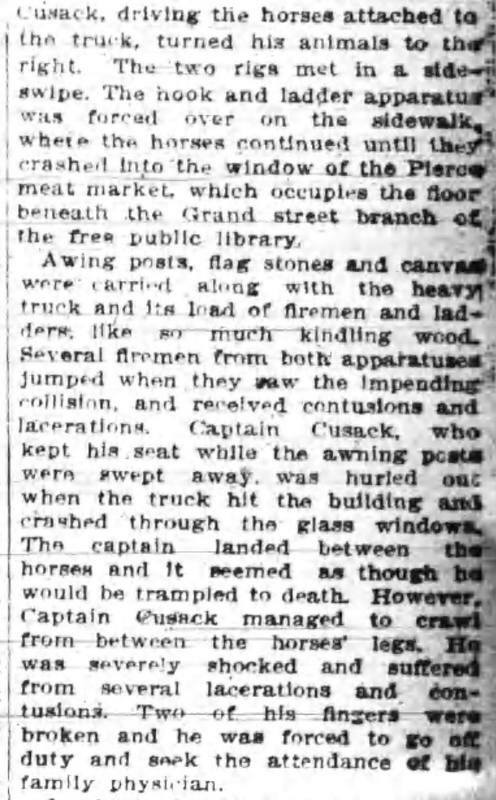 In 1888 the Fire Department was reorganized by a special committee consisting of Aldermen In 1888 the Fire Department was reorganized by a special committee consisting of Aldermen Macdonald, Miller and Kearney, and a partially paid department or "Call System" succeeded the volunteer system on March 20th, 1890, with four permanent men in nine engine and three hook and ladder companies, and eight call men to each. 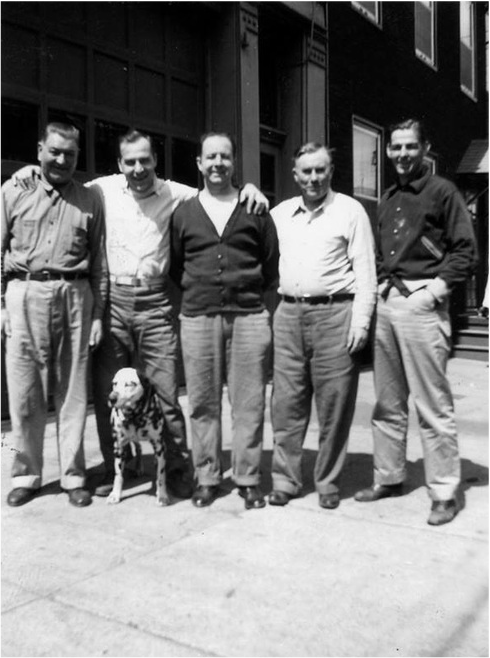 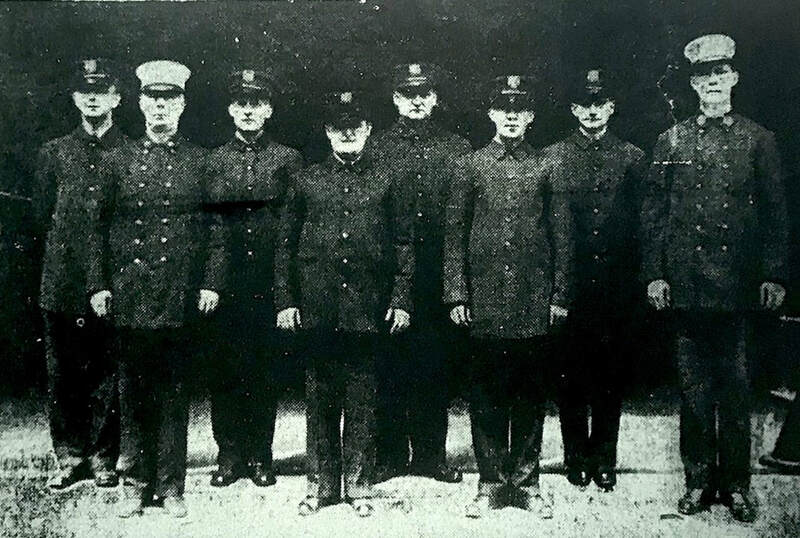 The fulltime men consisted of Captains, Engineers, Drivers and Tillermen as well as the chief, and two assistants. 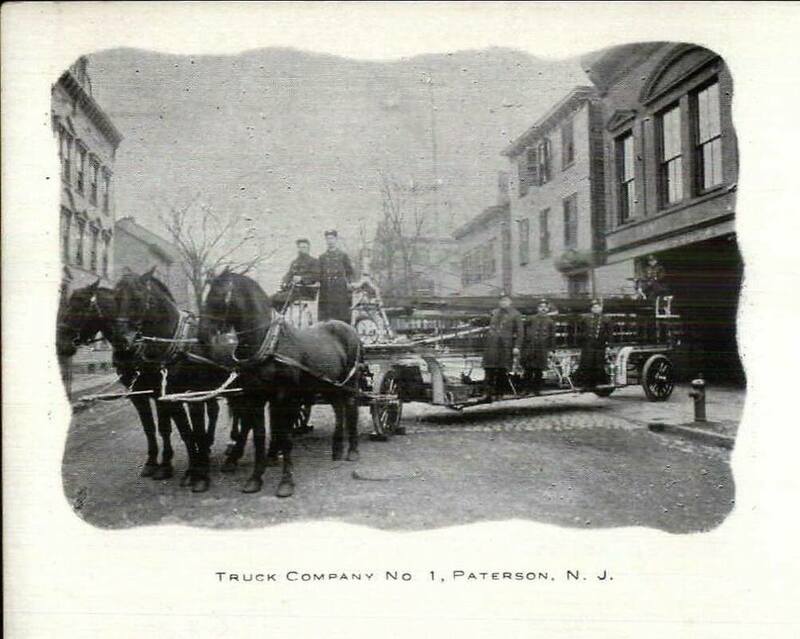 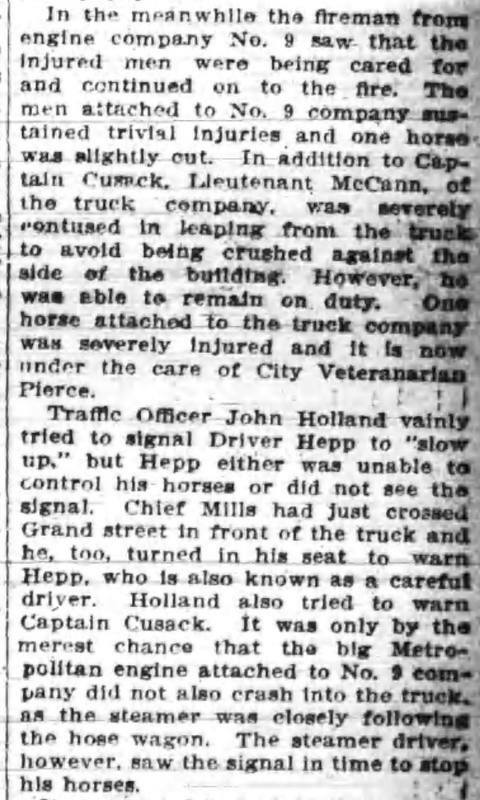 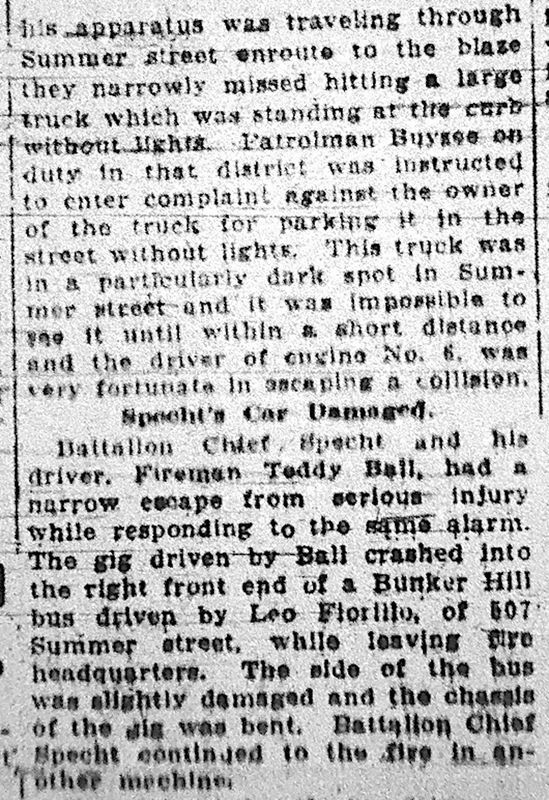 March 20, 1890: The transition from a totally volunteer department to partially paid "Call System" occurred and Eagle Hook and Ladder Company One became Truck Company 1. 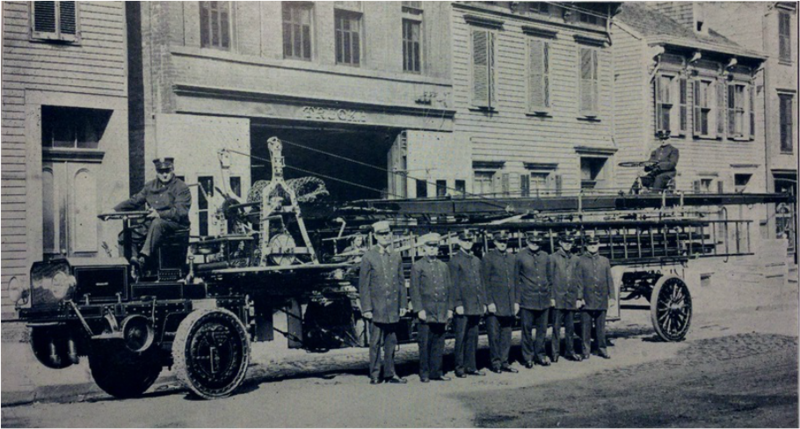 Apparatus: 1891 Truck built by Babcock Fire Extinguisher Company of Chicago which carried one 85 foot extension ladder, one 25 foot, one 20 foot, one 14 foot, one 12 foot, 2 three gallon extinguishers, poles, hooks, ropes, etc. 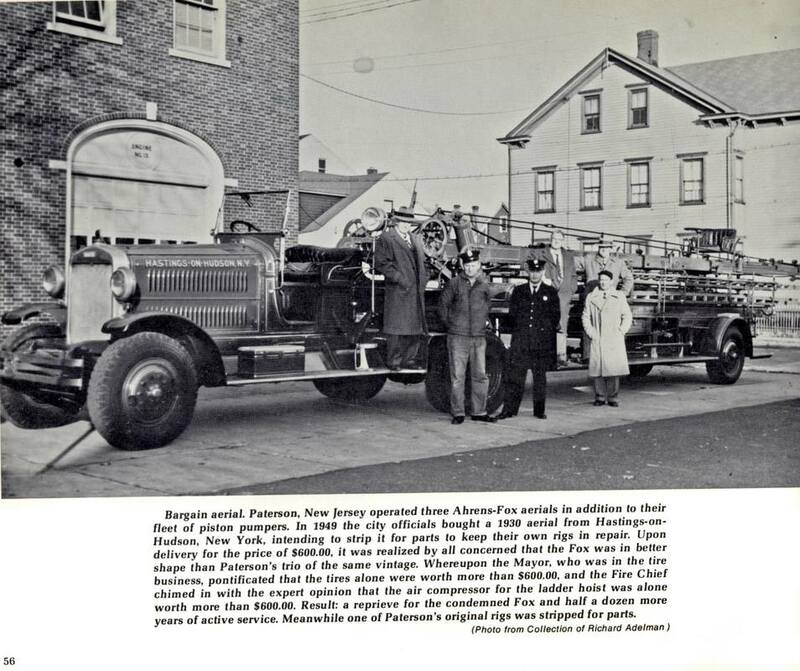 Also a Rawson water attachment with 50 feet of 3 inch hose. 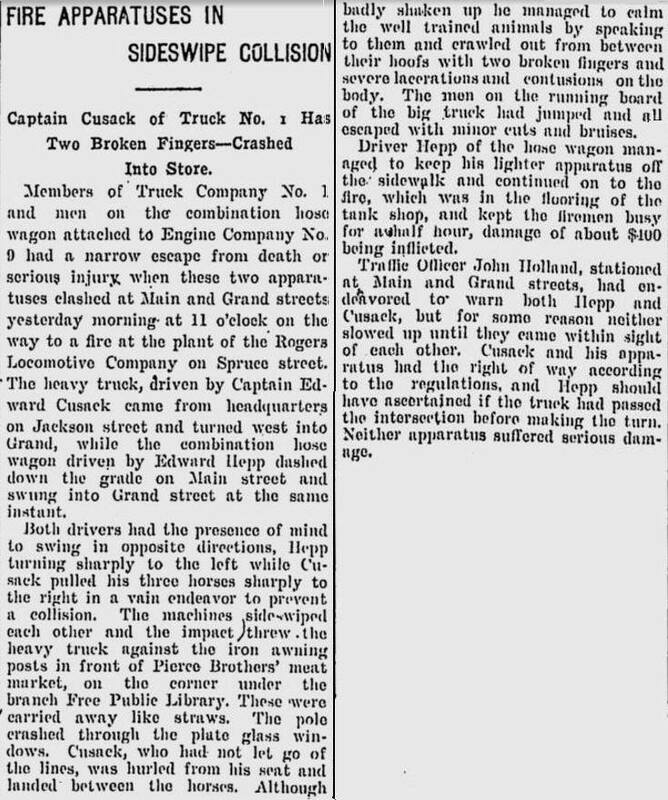 A three horse hitch was also purchased. 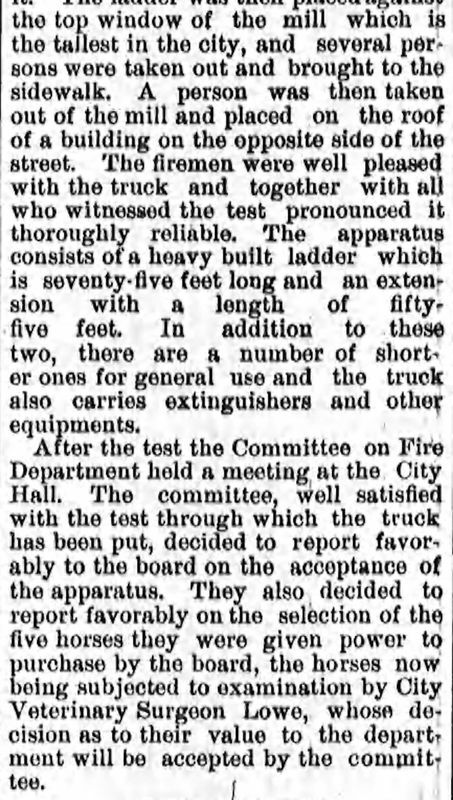 March 20, 1890: An 1889 Babcock Aerial Turntable Truck built by Babcock Fire Extinguishing Manufacturing Company of Chicago, which carried one 85-foot extension aerial ladder, one 55-foot extension ladder, one 38-foot, one 30-foot, one 25-foot, one 20-foot, one 14-foot, one 12-foot ; two 3-gallon extinguishers, poles, hooks, ropes, etc. 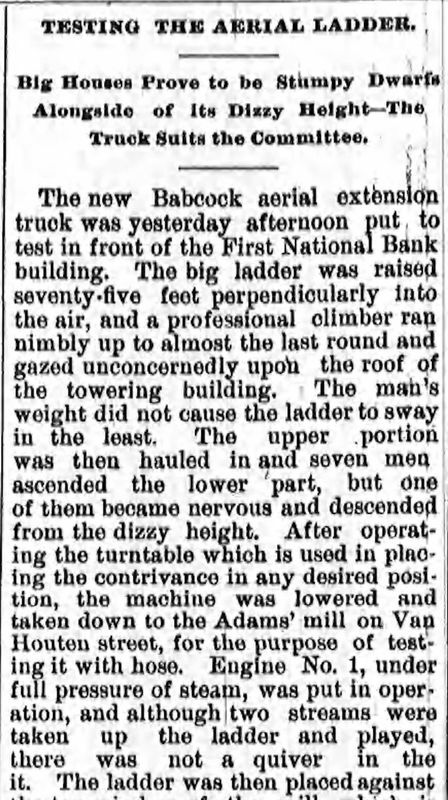 A Rawson Water Tower Attachment was added. 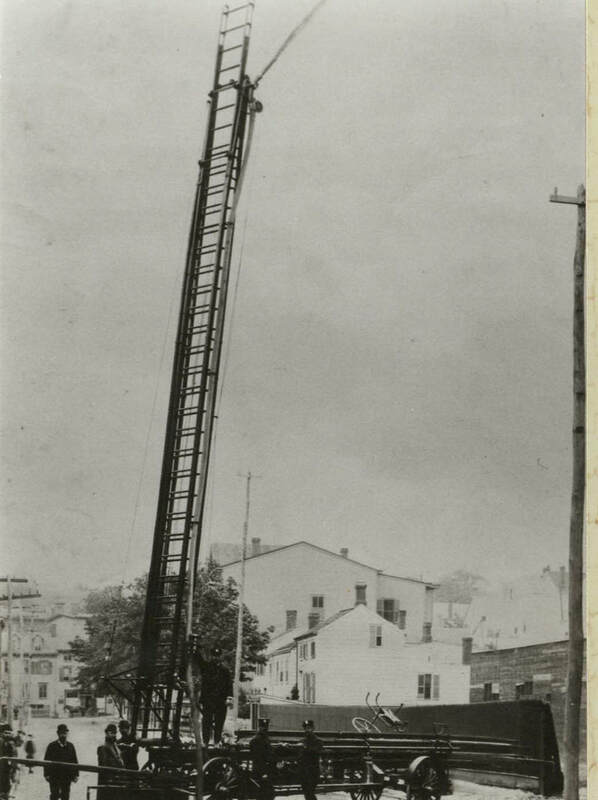 September 1904: New 75' LaFrance Aerial (shown below). 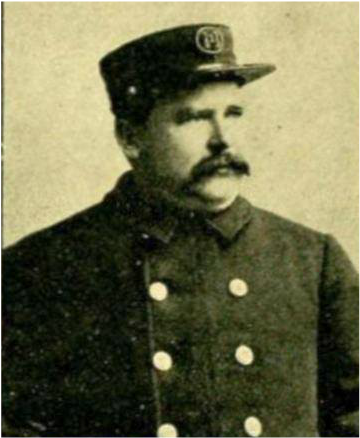 On the side is Captain Edward Cusack wearing his summer hat. 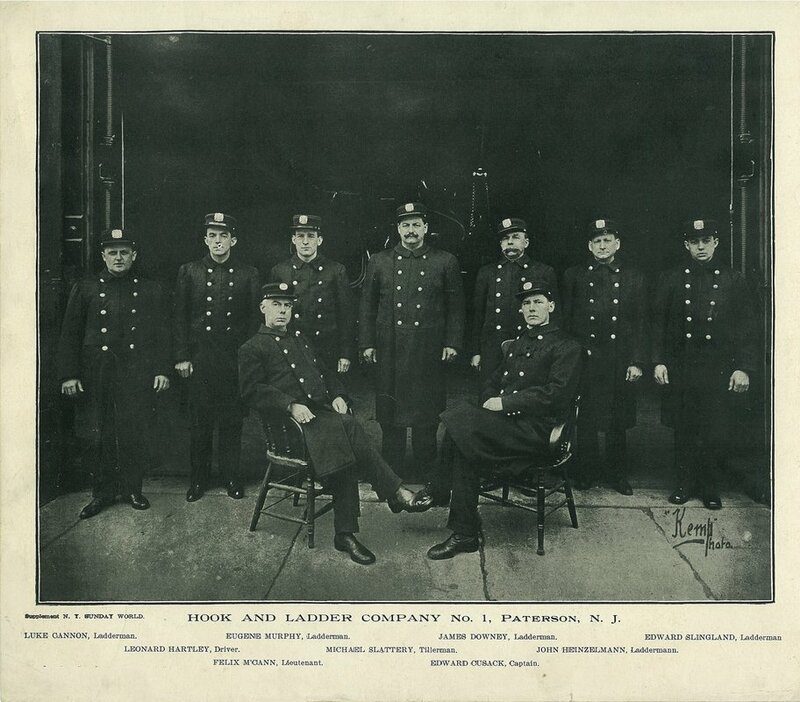 1908: Men of Hook and Ladder 1: Standing left-right: Luke Cannon, Eugene Murphy, James Downey, Edward Singland, Leonard Hartley, Michael Slattery, John Heinzelmann. 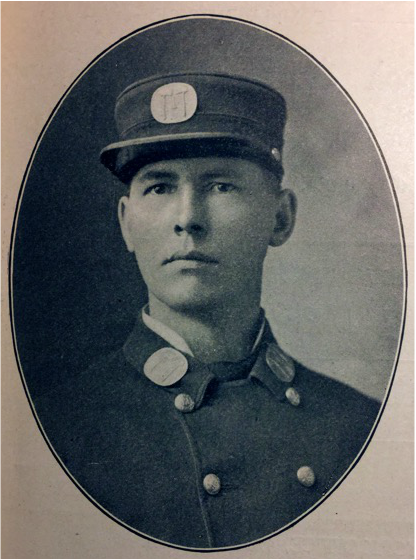 Sitting Lieutenant Felix McCann, Captain Edward Cusack. 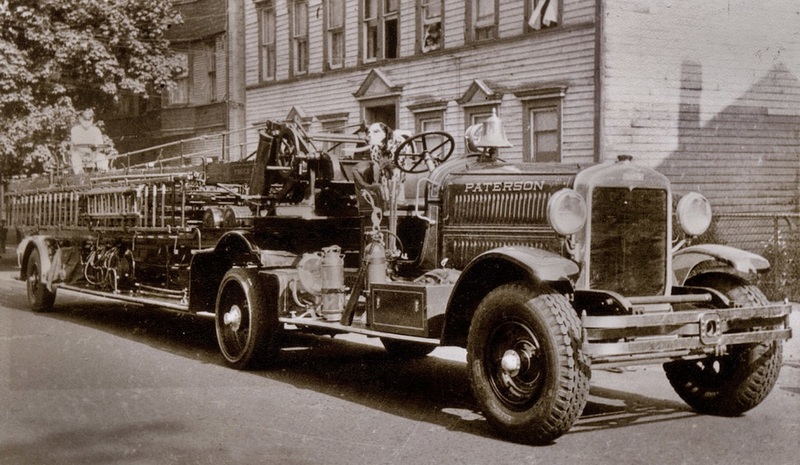 December 28, 1931: A 1929 Ahrens Fox 85-6-1 aerial truck formerly used by Truck Company 2 (Serial # 2046). 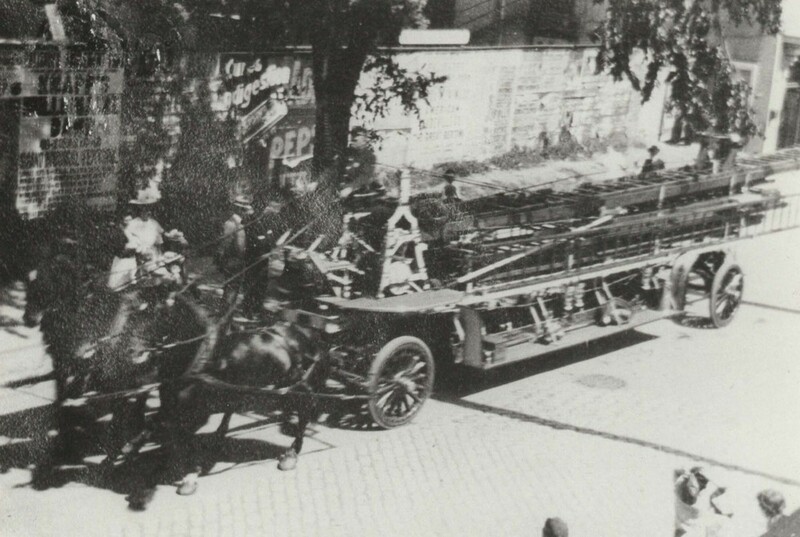 The apparatus is shown below on Jackson Street with Dalmatian on cab. 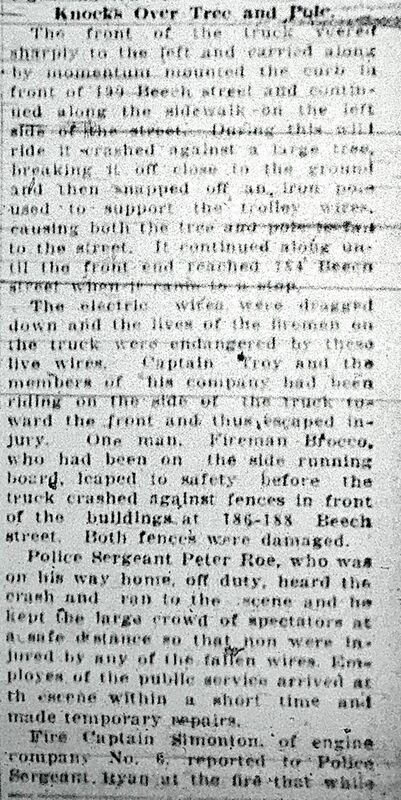 The electric (battery) powered aerial went out of service. 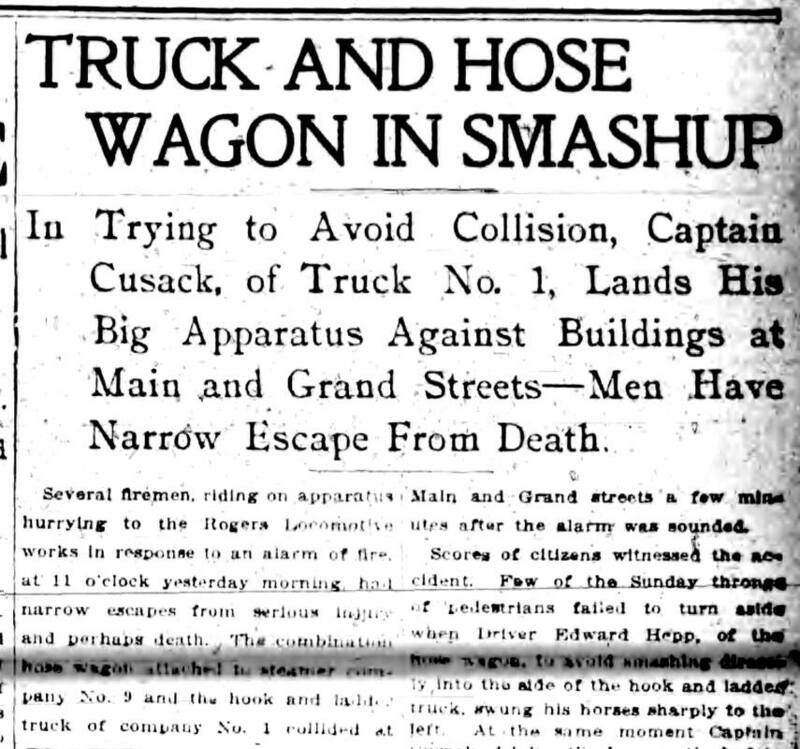 Note solid rubber tires on rear of tractor. 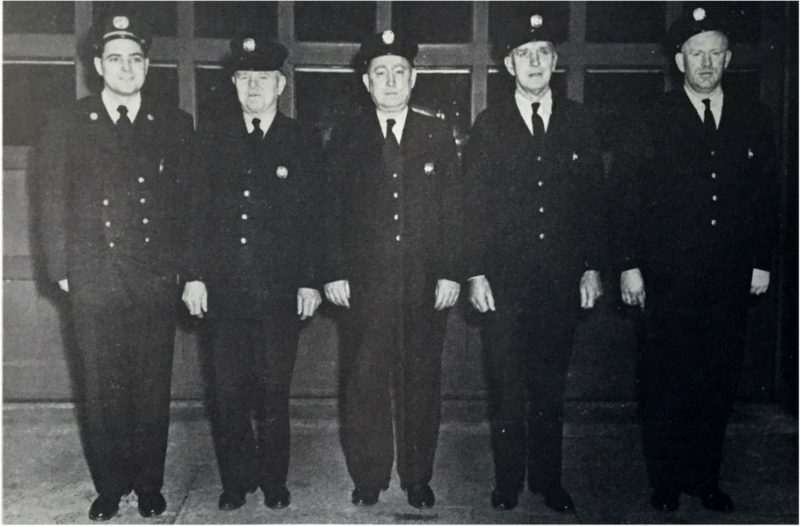 1949 Ball book photo: Truck Company 1 "A shift" Captain Solomon Reines, Edward McEwan (tillerman), Frank Dalton, Paul Shaw, John Rankin. 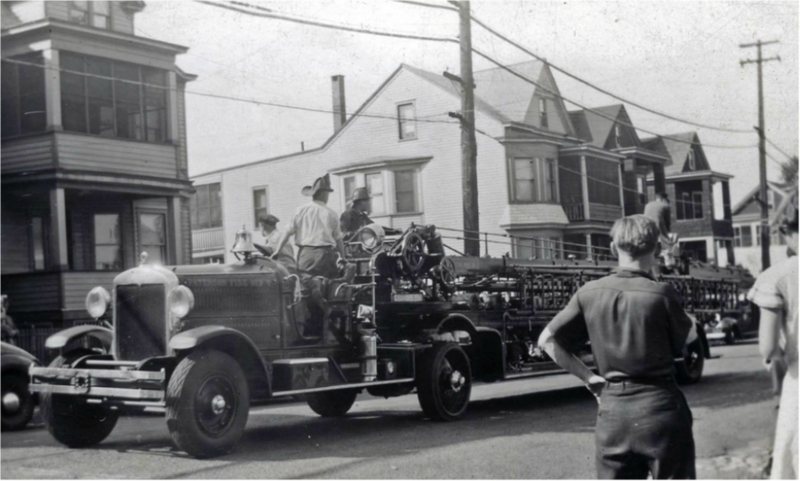 December 12, 1949: Truck 1 received a used 1929 Ahrens Fox 75-6-1 Aerial which was purchased for $600 (see receipt below) from Hastings on Hudson, NY. 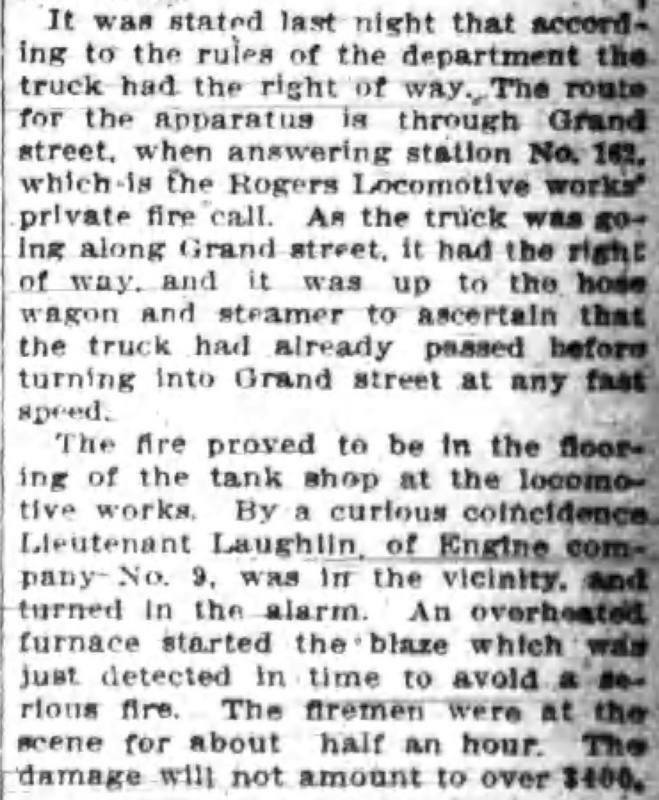 It was came with a windshield which was straight (not curved) across the top. 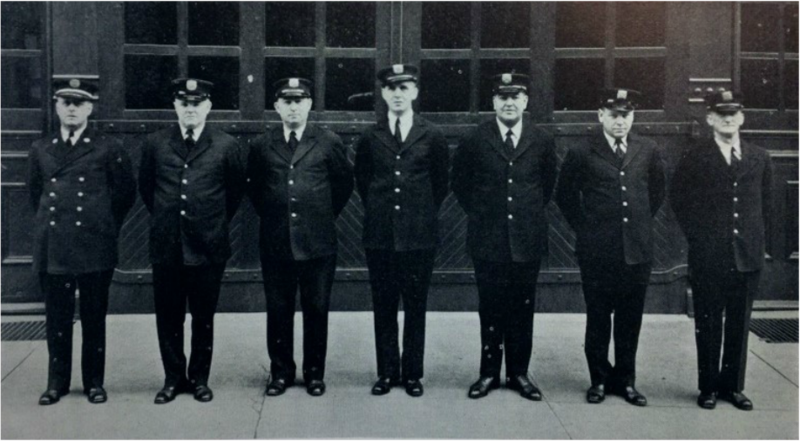 In the photo it is pictured on the apron at the 23rd Avenue Firehouse. 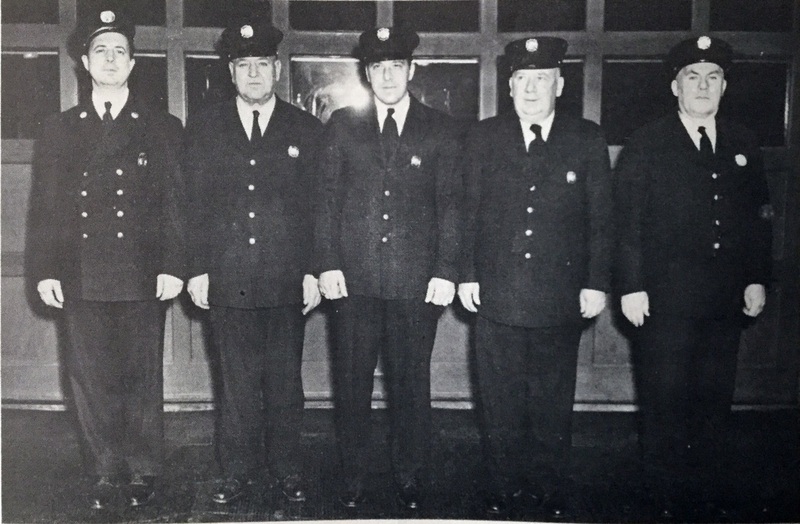 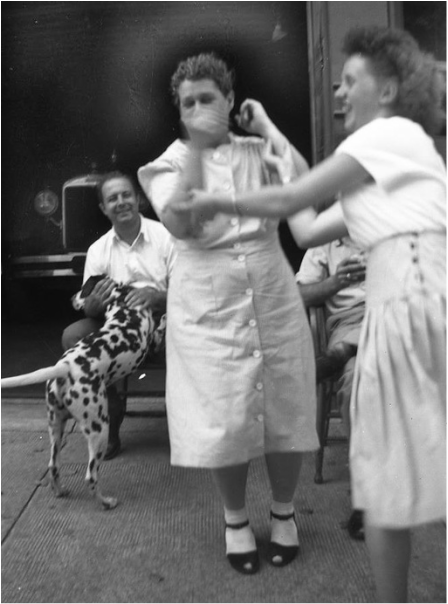 1952: Truck Company 1 relocated to the 23rd Avenue firehouse and the Jackson Street quarters was closed.